Ok, something I got early this month. I suppose it’s fitting that the first review I have for the site is Sanderson’s Mistborn, for several reasons. First is, of course, the word ‘born’ is really apt considering this review marks the start of the Languid Reader reviews, which is the main objective of the site anyway (hey, I didn’t say they weren’t inane reasons). The second reason is this really sets the tone of who I am as a reader at this stage of my life – I’m a curmudgeonly person who finds it hard to like something for the smallest of reasons. I gripe and I nitpick, and will generally be disagreeable for silly reasons. Perhaps I’ve gotten too jaded, or maybe it’s the inability to process things intellectually in a complete and careful way that is making me feel this way. To risk the cliche, I say “but this is my blog…”. I’m not new to Sanderson, having read his debut novel Elantris which arrived amidst general fanfare in 2005 and enjoyed it (more or less). There’s also the small matter of Sanderson being appointed to finish the run of Robert Jordan’s The Wheel of Time series after Jordan’s untimely demise. Apparently, if reports are to be believed, that commission came based on the strength of this very book I’m about review. So there’s a lot to imply that this book will not be a disappointment. However, Mistborn was a bit of a disappointment. I suppose I came to the book with high expectations. Having recently flipped through Elantris prior to this review, Sanderson does have the ability to tell a simple but effective story, and I came away generally impressed with what he accomplished with that one book. Mistborn, however, is the first of a trilogy, and perhaps Sanderson had to, uhm, watch the pace. 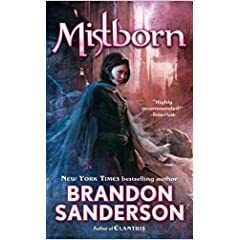 Mistborn is set in an apocalyptic world that is either in a fantastical past, or far-flung future as ashfall perpetually blankets the earth. The story begins with Kelsier, an unnaturally cheerful character for a leader of a bandit ring (complete with emotional baggage!) as he assembles a team to take down the supernatural Lord Ruler, leader of the Final Empire. Kelsier happens to be the only one who has ever escaped from the Pits of Hathsin, which is the Final Empire’s equivalent of Alcatraz, albeit without civil liberties for prisoner rights. As if that wasn’t enough, Kelsier is also a Mistborn, a rare manifestation of an innate ability to ‘burn’ metals to gain supernatural abilities. A 16-year old street urchin called Vin is recruited along with the rest of Kelsier’s crew, and during the course of the adventure, discovers not only that she is also a Mistborn, but an incredibly powerful one at that. The story continues to follow her as the book progresses, as she discovers her destiny and place in the world. I must admit I was compelled to stop reading several times early on in the novel. It wasn’t so much that the novel was incredibly badly written, it’s just the initial tedium of the prose and the clumsy scenes. There was one near the start where the thieving crew leader has a honest-to-goodness meeting that features perhaps the only medieval brainstorm session in literature (complete with a meeting secretary to take minutes!) to discuss ways to take down a ruling regime in place for thousands of years. The action items from this meeting was so open-ended and, in corporate parlance, ‘high-level’ that I literally laughed out loud. I have been party to many a corporate meeting, and having to read about one in a fantasy world is just wrong. It’s also too long in length. I liked the progression of the plot, but Sanderson took his time doing it. Sanderson also had opportunities, I felt, to make a more pronounced emotional connection as his heroes play in this world’s feudalistic society. As it stands, it’s very simple – the vassals to the Lord Ruler are evil bastards with carte blanche over the land or property in which he rules, and is possessed with a propensity to bully and oppress the slaves who work within the fiefdom. There were saving graces to the book, of course. Sanderson spent some time developing a very unique magical system for this universe, totally different from the one he developed for Elantris, or anything else that I’ve yet encountered. As a fantasy geek, one of the things that I really look forward in a new fantasy book is the technical engineering that goes into construction of the magical system. The author faces a unique challenge in that besides the obvious requisite skills in writing pleasant prose and a coming up with a good storyline, there is also the magical element. Some authors go into the minutiae (Jordan’s Wheel of Time, Farland’s Runelords series), while others gloss over the details (Harry Potter series, LOTR). Some authors ignore it completely; George RR Martin’s A Song of Ice and Fire series and Guy Gavriel Kay’s fares are examples where magic is nearly absent, yet does nothing to harm the quality of the stories they tell. Sanderson invented a unique magical ecosystem that revolves around the consumption and the ‘burning’ of metals, known as Allomancy. Magic users in this world (called Allomancers) ingest trace amounts of metals, and then using them to fuel the different powers available to magic users. Different metals allow different abilities (pewter enhances strength, tin endows superhuman senses, etc). Mistborn are Allomancers who have the ability to multiple types of metals at once, and apparently Mistborns are very rare. Sanderson’s system of Allomancy is novel and imaginative, although throughout the book I keep, for some unknown reason, conjuring up images of characters scraping their teeth against discarded pipes. Having said all that, I’m cognizant of the fact that I did complete the book. Somehow I persisted, and 4353 clicks later (yes, I read this on my Blackberry, and no, it had no bearing on my thoughts of the book) I concluded that Sanderson did enough to keep me interested. The unique magical system helps keep the book interesting for a while more, at least.. If you’re on the lookout for an easy-to-pick up fantasy, then this will keep you purring with contentment. I close knowing I will probably give the second book a go. Just not right away.